Are you trying to find the best fabric cutter for sewing, craft and/or designing? As an avid crafter who use material both for sewing projects as well as for craft, I know how time consuming cutting fabric for panels and shapes can be. Fortunately technology can make this step truly quick and easy for you. With innovative machines that have nifty features and abilities, the best fabric cutting machine will help you to create precision fabric cuts with ease! Of course technology and innovation typically comes with a high price tag. So it is important that you find the best fabric machine for the money that you know will last you for many years to come. 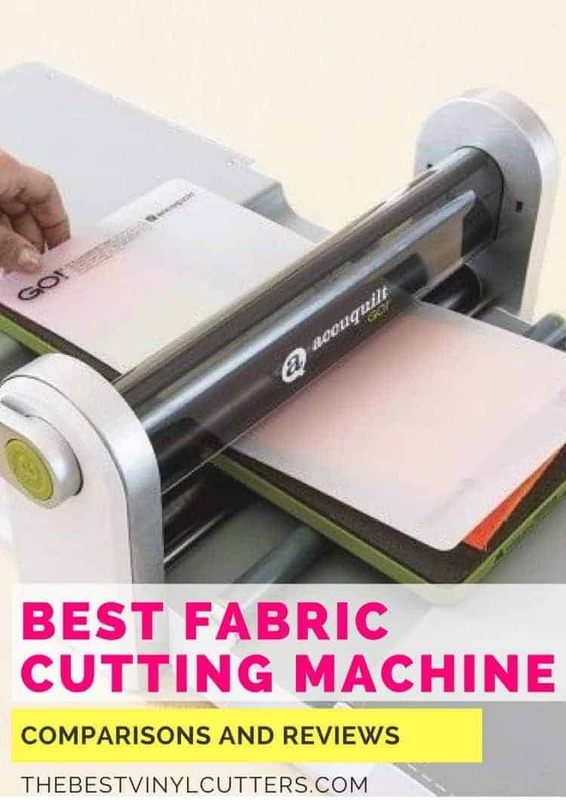 So without further ado, here is the best fabric cutters’ 2019 buyers guide; together with the top 10 fabric cutting machine reviews to help you choose the right cloth cutting machine for your budget and your needs! What is the Best Fabric Cutter Machine? 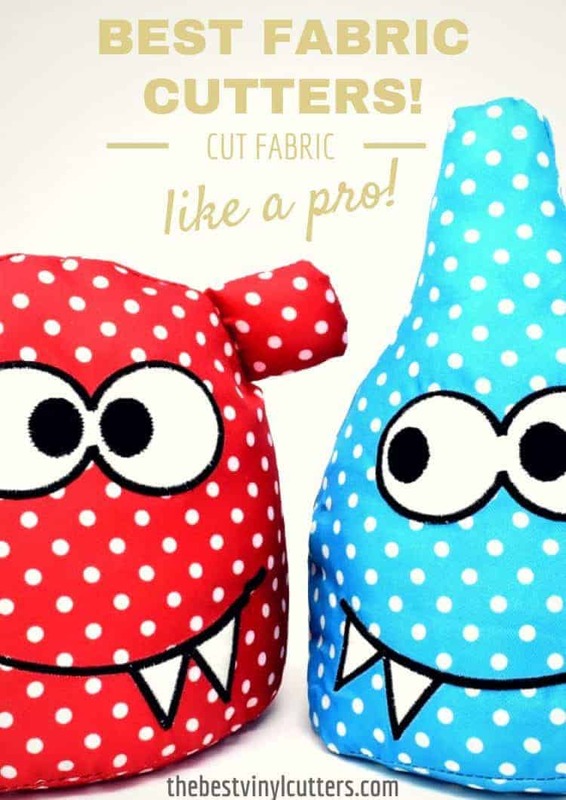 How to Choose the Right Fabric Cutter for You! What is a Fabric Cutting Machine? In this fabric cutting machines buying guide, we suggest you check out our comparison chart of the best fabric cutters and then read our fabric cutter reviews of the machines that best suit your requirements. We love playing with the newest and latest machines, so you can rest assured that we have the best fabric cutter machine 2019 has to offer! Below is a comparison chart of all the top fabric cutting machines, which are mentioned in this article. You can then read my reviews below featuring the best fabric cutting machine 2019 has to offer. 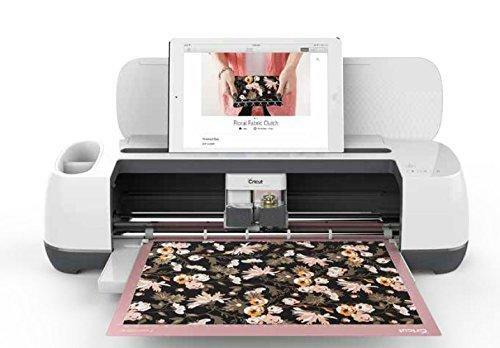 The Best Digital Fabric Cutter of 2019 is the Cricut Maker Cutter! The Cricut Maker offers some of the best features and technology for those who wish to cut fabric! It uses a Rotary Blade that can create clean and precise cuts from sewing patterns. This blade can be used on fabric without the need for backing, spray starch or Terial Magic. 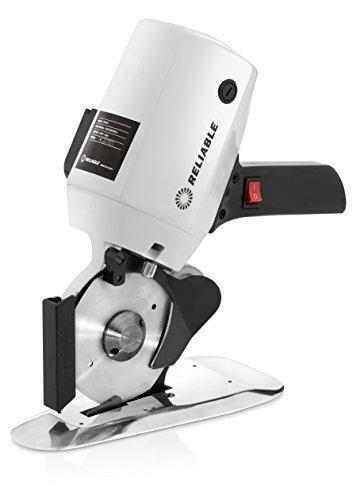 It can cut straight lines, right angles or curves and deliver fabric cuts without tearing or snagging. The machine can cut over 100+ materials from thin fabric such as silk to 2.4mm thick material (if you purchase the Knife Blade). 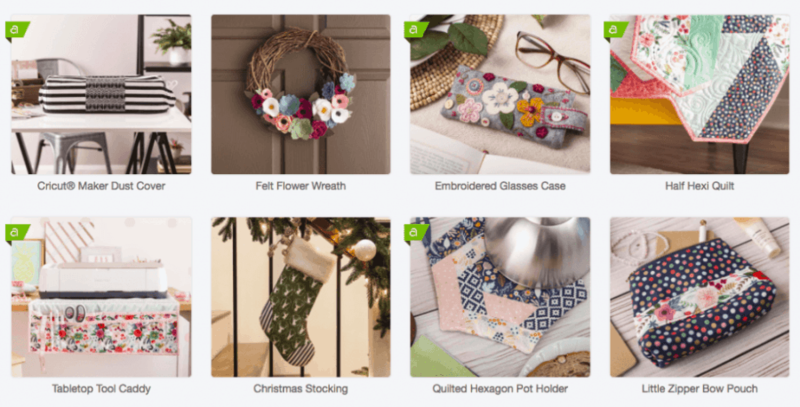 Cricut has teamed up with Simplicity patterns and Riley Blake Designs to bring you ready-to-make projects that come free with the Cricut Maker. You can choose one of the 25 free sewing patterns available on the library or you could choose to purchase patterns as they are released. It is a totally innovative and powerful machine. It offers lighting-fast speed and intricate precision cutting. It will streamline your sewing process and speed up the boring aspect of cutting out your panels so that you can get to your sewing machine quicker. So clever! We love this machine! Wondering what you can make with your Cricut Maker? Why not browse our Cricut Maker fabric project ideas here. You can also get some great ideas of fun things you can make with felt here. 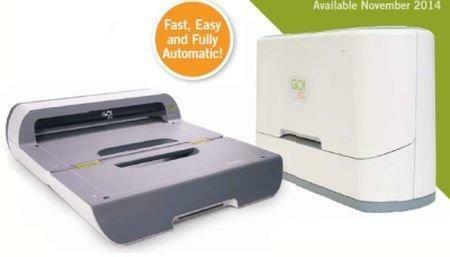 NOTE: If you are a quilter, we recommend you save your dollars and check out the AccuQuilt GO Fabric Cutter. This cutter is the best fabric cutter for quilting and a lot cheaper than the fancy Maker. For more information about why recommend this machine as the best fabric die cutting machine, read our Cricut Maker Review. I also suggest you browse through our list of the Best Cricut Maker Bundle Deals as well. Find below some guidelines to follow in order to help find the best fabric cutter for your needs. 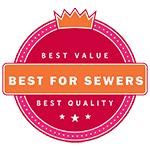 Keep in mind that you will always get what you pay for when it comes to fabric cutting tools. If you are after a really basic manual die cutting machine, you easily pick one up for around $80, but if you are after a more versatile and electronic machine that can cut out fabric automatically, then you will need to be prepared to pay a higher price tag of around $300-$500. What size cuts would you like to create? Are you after a machine to cut fabric strips or sewing panels? Another important feature of a machine is whether it is portable to take along to sewing or craft workshops and retreats. 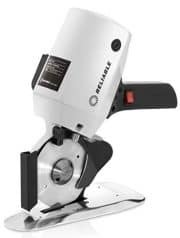 If you often use a machine in a location away from an electric point, you might also prefer a manual crank cutter. Think about how much space you have available in your craft room for the machine. You get two main types of fabric cutting machines. The best choice is to invest in an electric fabric cutter. Of course an automatic fabric cutting machine will cost you more money, but it will also save you loads of time and for many of us, time is money! Of course if you are after a fabric cutting machine for home use, you might want to save your pennies and settle for a manual fabric cutting machine. These machines take up less space and are also easier to carry around. Below you will find the best fabric cutting machines for home and small business use. We will have a close look at a top cutter machine for fabric. I will outline the top features, the pros and cons of each in detailed cloth cutting machine reviews, which should help you choose the best machine 2019 has on offer. 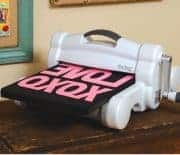 The Cricut Maker is our pick as the best Cricut fabric cutter in 2019. It is an electric fabric cutter machine and has the ability to work from ready-to-go images and sewing patterns. You can also send your own choice of images to the machine to cut. This machine is a brilliant buy and happens to be the top fabric cutting machine on the market in 2019! We love this machine for fabric cutting as it is one of the few machines that has the ability to cut material as is, no need to stiffen the material or to use backing! YAY!! It also has the ability to cut your sewing pieces right from sewing patterns. Simply browse the library that comes with the machine. There are hundreds of patterns available from top brands like Simplicity and Riley Blake. You can also upload your own pattern to cut as well. The Cricut Maker is one of the newest cutting machines on the market and it is our choice as the top fabric pattern cutting machine. It has mostly been created to fill in the gap as one of the most impressive fabric die cutting machines, but it also has the ability to cut over 100+ other material as well. Sewers will be thrilled to know that this machine can cut out their sewing patterns for them. Whilst other crafters will enjoy the fact that the machine can cut material up to 2.4mm in thickness. In order to enjoy the fabric abilities of this beautiful machine, you will need to invest in two additional tools. >>> CLICK TO READ FULL CRICUT MAKER REVIEW OR CLICK BUTTON BELOW TO SEE THE AUTOMATIC FABRIC CUTTING MACHINE PRICE. 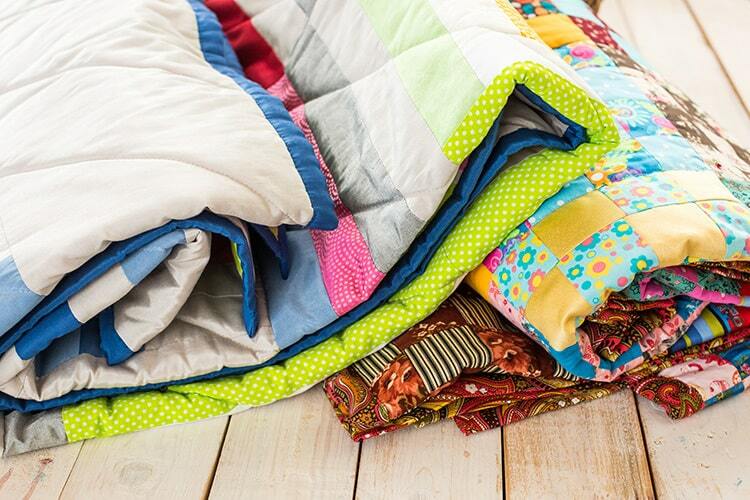 Our second favorite machine for fabric is the AccuQuilt BO! Big. It is our pick as the best fabric cutting machine for quilting. Our favourite features about this machine is that it is electronic. It reduces down cutting time with the ability of being able to cut 6 layers of fabric all at once. You will need to purchase GO! fabric cutter dies for this machine. The machine can take dies up to 14" in size. You could also easily cut 2 x 6" dies side by side to maximize on time. The machine delivers precision cuts and if you love quilting, you will love this brilliant machine. 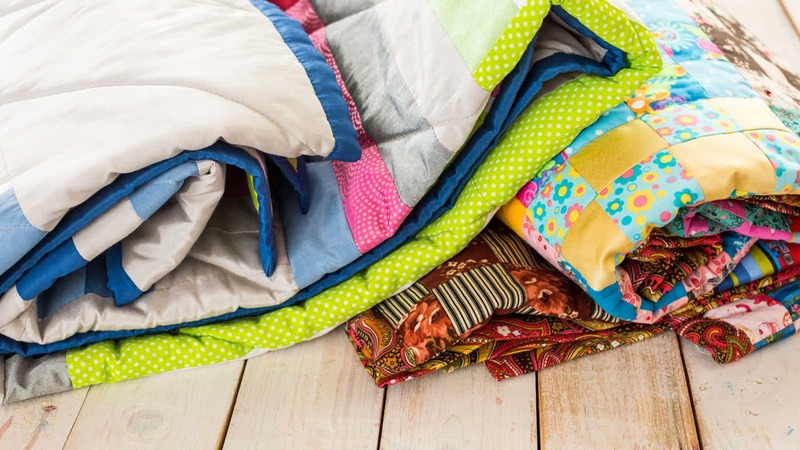 If you are a serious quilter, you will love the AccuQuilt GO! Big machine. The machine has its limitations for those who wish to work with sewing patterns as you are limited to the dies that are produced by AccuQuilt, so if you prefer working from patterns, we highly recommend the Cricut Maker machine. Whilst some people find this machine to be a bit pricey, we think the extra $$$ is worth it for the sake of purchasing an electronic machine. Unless you feel like exersizing your arm muscles, in which case you might prefer the cheaper manual AccuQuilt GO! machine below. To get you started, AccuQuilt has included one free die as well as 6 patterns to accompany the die. All other dies will need to be purchased additionally. >>> CLICK TO CHECK THE LATEST PRICE OR CLICK BUTTON BELOW TO BUY NOW. The AccuQuilt GO! is essentially the same machine as its big brother up above. The cheaper price tag is due to the fact that whilst the AccuQuilt GO! Big is electronic, this machine is crank operated. The GO! can also only cut up to 10" in width in comparison to the Big that cut up to 14" in width. 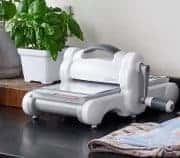 The machine is perfect for cutting fabric for quilting, so if you are interested in cutting panels from a sewing pattern, I suggest you look at the Cricut Maker Machine instead. The AccuQuilt GO! is a great and affordable quilt fabric cutting machine. We love that it can handle dies of up to 10" in width. The machine also have a flexible plate, which is so much better than the acrylic plate that comes with a Sizzix as they tend to warp. As far as manual fabric cutters for quilting go, this would have to be our favorite machine. 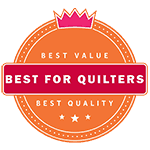 Sure it is a bit more pricey than the Sizzix machines and yes it is limited to only using the AccuQuilt dies, but it is a brand that is focused on quilting as its main focus, which means that dies you can purchase will be brilliant. The Sizzix Big Shot Machine is the best die cut machine that is specifically designed for card-makers, scrapbook addicts as well as quilters. The machine works with Sizzix fabric dies (although you can use dies from other brands as well). 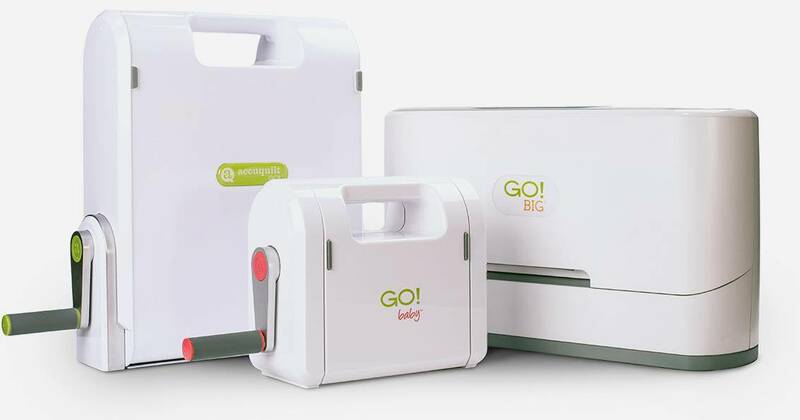 The Big Shot die cut machine works with a crank and it is small enough to cart around to craft or sewing events and workshops. The fabric shape cutter can handle all sorts of materials from paper, vellum, fabric, chipboard, and cork, making it truly versatile. Extra costs involved when purchasing Sizzix Big Shot dies for fabric. The S﻿izzix 660425 ﻿B﻿ig ﻿S﻿hot is by far the best manual die cutting machine on the market in 2019! If you are after an affordable machine that is small enough to cart around, and you don't mind the labour of the crank, then this is the one for you! Whilst you will be limited to cutting fabric shapes from dies, this nifty machine is powerful enough to cut through 8 layers of fabric all at once. If you sandwich up your die properly you should get some beautiful clean fabric cuts. A hot favorite by a brand that we all trust and love! >>> CLICK TO CHECK THE LATEST PRICE , READ OUR SIZZIX BIG SHOT REVIEW, OR CLICK BUTTON BELOW TO BUY NOW. 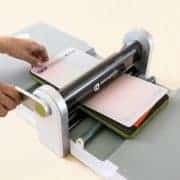 In most ways the Sizzix Big Shot Plus is similar to the Sizzix Big Shot; essentially the machine is just giving you a larger cutting space (can cut up to 8.5 x 11") to work with. It is a really popular combo die cutting embossing machine and it has the ability to cut all sorts of materials from fabric, to paper, vellum, chipboard, and cork. It is still lightweight and portable and it also still features a crank mechanism. There are a wide range of Sizzix fabric cutting dies available, and the beauty of this machine is that you can use dies from other brands as well. This Sizzix Fabric Cutter is perfect for those who are after a great fabric die cut machine! The Big Shot Plus offers a wider cutting width than its little brother the Big Shot. It is a brilliant machine for those who love to enjoy their craft with groups and friends, due to its lightweight and portable features. You might even wish to purchase the whole Sizzix Big Shot Plus Starter Kit! >>> CLICK TO CHECK THE LATEST PRICE , READ OUR SIZZIX BIG SHOT PLUS REVIEW, OR CLICK BUTTON BELOW TO BUY NOW. The Reliable 4" Octagonal Knife Cloth Cutting Machine is a really handy rotary cutter to have on hand. It cuts fabric up to 1" thick. We absolutely love this rotary cutter as the combination of the octagonal blade, carbide tipped counter blade and spring loaded lower blade make this cutter jam-resistant - hooray! This fabric cutting wheel is lightweight, electronic and truly super easy and simple to use! It is best for light to medium weight material, so if you need to cut thicker material or felt, we suggest you have a look at the material cutting machines listed above. We love this cutter and really feel that it is the best rotary cutter for fabric on the market in 2019! Built-in sharpening mechanism - very clever! Can't cut thicker materials, best to stick to light to medium weight material only. We absolutely love the Reliable Rotary Material Cutter in combination with a machine. Whilst we prefer one of the machines listed above to handle cutting shapes and panels; a fabric cutter roller is really beneficial to cut off excess material, to shorten pants, or simply to cut strips. It is much easier to grab when time is limited and when you feel confident in your own freehand cutting abilities. 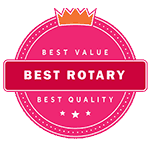 Grab this fabulous rotary cutting machine for fabric, you won't be disappointed! The Silhouette Portrait 2 machine is another choice as an electric fabric die cutter machine! ​The Portrait 2 can cut over 100+ materials, including fabric. It can handle material up to 2mm thick. What we love about this machine is that the auto-blade will adjust your blade depth for you, so no thinking or testing is required. We also love that you can customize your own projects. Whilst this is our go-to machine when we want to make a custom die cut sticker or die cut vinyl decal, we do however prefer the Cricut Maker over this machine. ​But the Portrait 2 is cheaper than the Maker if you wish to save a bit of money. The S﻿ilhouette ﻿P﻿ortrait ﻿2 D﻿ie ﻿C﻿utting Machine is brilliant for those who wish they could afford the Cricut Maker but just can't reach the dollar price! It is a great little machine if you love to create custom patterns or if you want the flexibility of cutting panels of up to 12" in width. The machine doesn't operate with dies, so if you are a quilter, you might prefer the AccuQuilt or Sixxiz machines instead. If you are after an electronic fabric cutter with a cheap price tag, then this is the one for you! We love how easy cutting fabric with the Silhouette autoblade is. Still not sure? Why not read our full Silhouette Portrait 2 review here. The AccuQuilt GO! Baby is essentially the same machine as its big brother the AccuQuilt GO! up above. The cheaper price tag is due to the fact that whilst the AccuQuilt GO! can cut up 10" in width, the Baby can only cut up to 6" in width. ​The machine is perfect for cutting fabric for quilting, so if you are interested in cutting panels from a sewing pattern, I suggest you look at the Cricut Maker Machine instead. The AccuQuilt GO! Baby is a great and affordable quilt fabric cutting machine. As far as manual fabric cutters for quilting go, this would have to be our favorite machine, but we do prefer the electronic AccuQuilt GO! Big machine above this one. One of the negatives of the Accuquilt Fabric Cutter is that you are limited to only using the actual AccuQuilt dies, but they do have a lovely extensive die library, so you will most likely find that if you are a quilter, you won't need to go beyond their dies that are on offer. 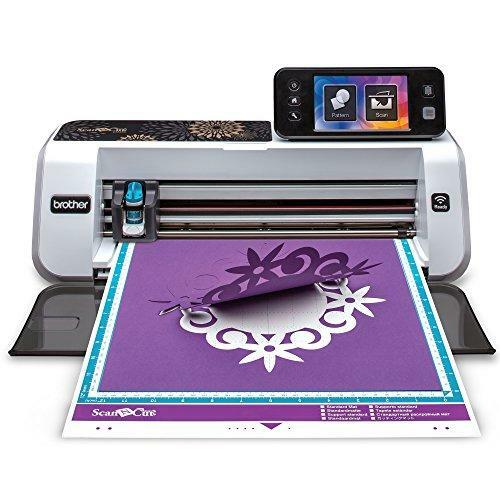 The B﻿rother ﻿S﻿can n ﻿C﻿ut 2 ﻿CM﻿650﻿W is a super popular machine for those who love to scan in their own hand-drawn designs to cut out! If you love cutting your designs on material, then this will also most likely be the winning machine for you! We love the Brother die cut machine as it is a fairly simple machine to use. The negative is that the simplicity means that there isn't much room for customization. The Brother ScanNCut2 CM650W can cut a maximum width of 11.5″, which is all that is needed for most hobbyist crafters. 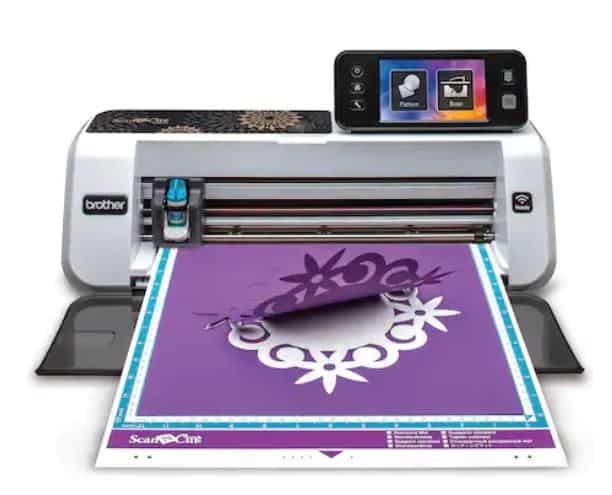 The B﻿rother ﻿S﻿can and ﻿C﻿ut 2 ﻿CM﻿650﻿W is best suited for crafters who are happy to make use of existing designs or those who enjoy scanning their own hand-drawn designs. Whilst we do love the ability to cut whatever designs we want, as you can see in the video above, there is quite a bit of stuffing around with the fabric support sheet as well as test runs to get the right settings; which is why we prefer using the Cricut Maker instead as it is so much more time efficient (and a newer machine as well). 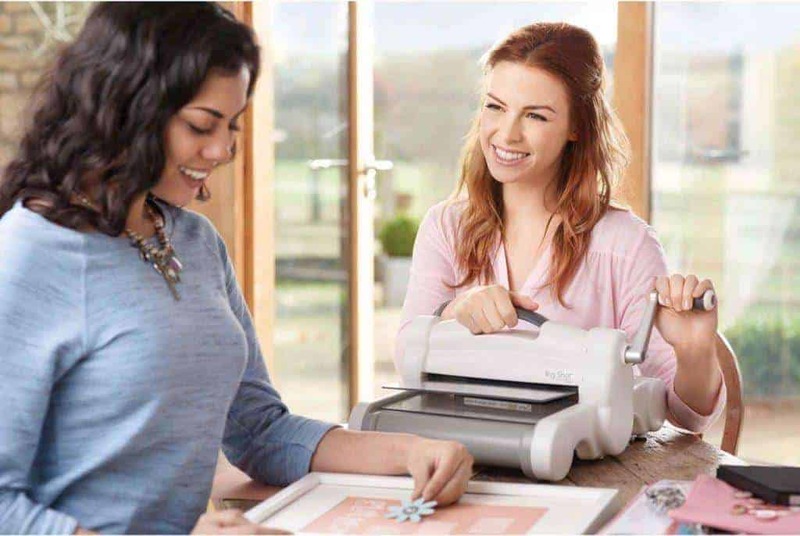 Can cut max width of 11.5"
The B﻿rother ﻿S﻿can n ﻿C﻿ut 2 is the only machine that offer crafters the ability to scan in and cut their own art work, photos, images and more! It doesn't allow much scope for custom work as you are limited to either the scanned art work of the library of images and fonts that comes with the machine. 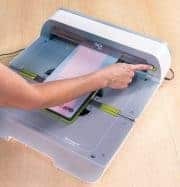 Not our favorite machine, but if you want to scan images and then cut them, then Brother Fabric Cutter is your only choice. If your passion is to cut fabric strips, you will love this Simplicity Electronic Strip Cutter. This little powerhouse of a machine can cut through paper, felt, fleece, cotton, lightweight wool and so much more. The machine operates like a sewing machine with a foot pedal. It has an adjustable guide to cuts strips from 1/2" to 2 1/2" in width. 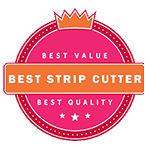 You will get two machines blades with the machine: a blade for straight cutting and one for pinking. You could also choose to purchase additional blades: large wave blade, small wave blade, deckle blade, perforating blade, and scallop blade. The machine has one job, so it really isn't very versatile, but if you are after a way to cut strips quickly and easily then this might just be the machine for you! Watch the short video below to see the machine in action. Instructions that come with the machine could be more helpful in regards to setting tension for the cuts. 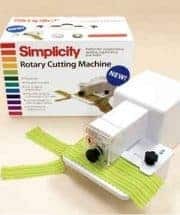 The Simplicity Rotary Cutting Machine is a great material cutting machine if you want to save time on cutting all of your fabric strips. 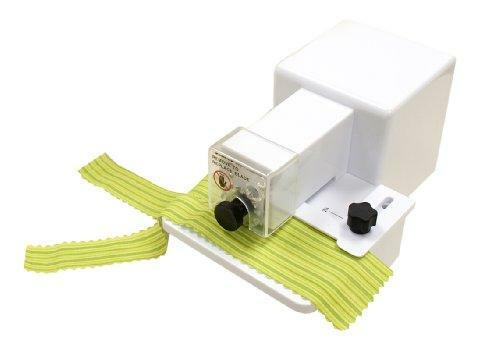 Once you get the hang of this machine, can you easily and quickly cut out strips for your sewing or quilting projects. It is important to note that this machine has one main function - it is a fabric strip cutting machine ONLY, and that it can only cut up to 2 1/2" in width. Many crafters struggle to get the hang of cutting a straight strip, so be prepared to waste a few material strips before you manage to get the hang off this machine. We much prefer to use one one of the machines listed above, but if all you want to do is to cut strips, then this is the machine for you. A fabric cutting machine is a machine that has the special blades that can cut through fabric. You can different types of fabric cutters. Your manual fabric cutters are designed as die cutting machines. They are crank operated and can cut out smaller shapes or quilter squares, but their ability is limited by the cutting dies that are available. The newer digital fabric cutters have the ability to cut using images found online. The Cricut Maker also has the ability to cut panels from online sewing patterns - but is limited in cutting size. Rotary cutters are fabulous for simply cutting your fabric (instead of using scissors). They are great when you need to make straight cuts as you can quickly roll the circle blade along a steel ruler or fabric mat. Lastly fabric strip cutters are electronic cutters that have the ability to cut strips of fabric, which is great for quilting purposes. Yes, Cricut Machines can cut fabric. The Cricut Explore Cutters have the ability to cut fabric, but you have to bond the fabric prior to cutting. 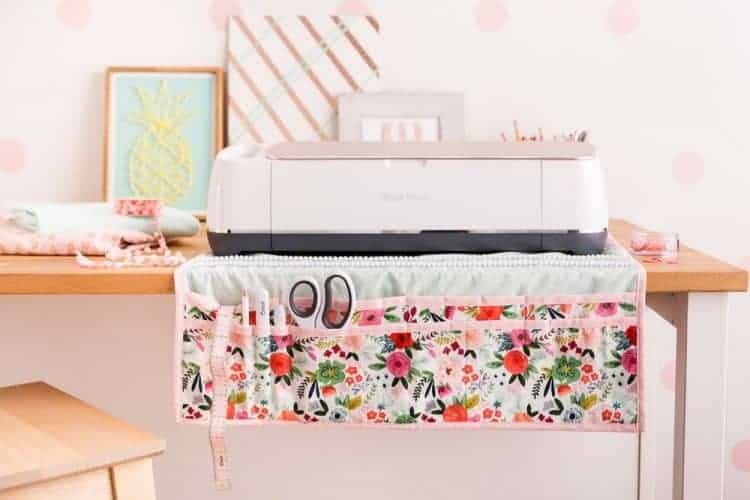 The Cricut Maker has been designed for fabric crafts and it has the ability to cut fabric without the need for a stabilizer. So hopefully you will have another look at our fabric cutter reviews in our fabric cutting machine buying guide above and see if you can find a suitable machine for your needs and for your budget. Now that you have found a new fabric cutting machine for your office or business, why not hop over to our craft blog section. We have loads of tutorials, project examples as well as step-by-step posts to help you. Bookmark this handy guide by pinning it to one of your Pinterest boards!